Pancakes are my kids favorite breakfast food. If given the option they would have pancakes every day of the week. In the real world, they get to have pancakes for breakfast on the weekends. It never fails that I always end up making too much batter and it ends up getting washed down the drain. I was recently introduced to a new product that is simply genius! Batter Blaster comes in a can just like spray whip cream. It's a pancake batter that is prepared and ready to use. Now I have the perfect amount of pancake batter at my fingertips. Literally! No more pancake batter down the drain! I'll admit that I had a blonde moment the first time I went to the store looking for Batter Blaster. I actually left the store disappointed that it wasn't available in our area even though I had checked the store locator before heading out to make my purchase. Batter Blaster is found in the dairy aisle of the grocery store and not in the pancake aisle. DUH! With Batter Blaster making pancakes is faster and easier than ever. Simply shake, spray, cook and ENJOY! It's so simple that even the kids can help make pancakes for breakfast. With adult supervision, of course. My parents were visiting over the weekend and we made pancakes for Sunday morning breakfast. One can of Batter Blaster made enough pancakes to feed four adults and two children. Those two children eat more pancakes than any adult I know. The pancakes were delicious. My daughter couldn't eat enough of the chocolate pancakes, they were her favorite. We will definitely be keeping a can (or two) in the house at all times and taking a can of Batter Blaster camping with us this summer! 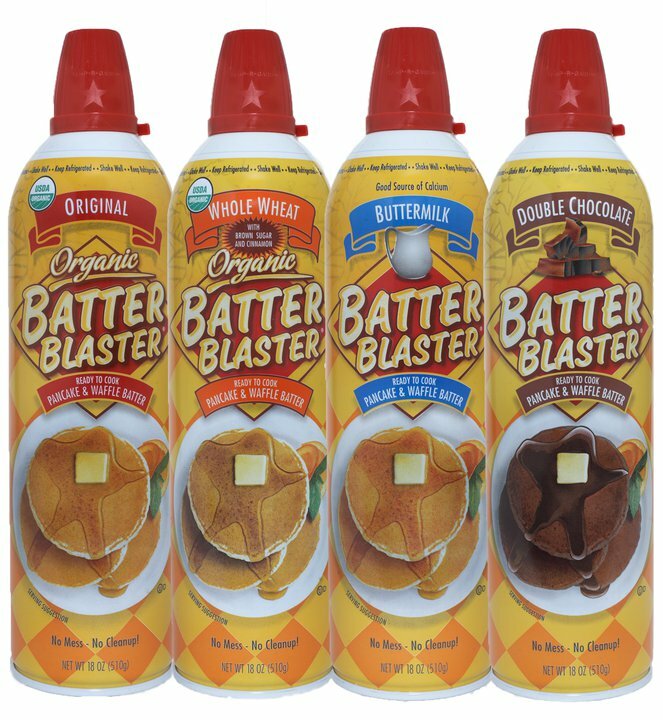 Visit Batter Blaster and tell me which flavor you would most like to try. A special thanks to Batter Blaster for this great review and giveaway opportunity! We have seen this in the store and have always wanted to try it! We would like to try the Original variety. Being Frugal and Making it Work Facebook fan! 2.Networked blog follower~ Jennifer L.
I would want to try Chocolate! I would like to try the Buttermilk flavor the most though the Double chocolate sounds so tempting also! Thanks! This product I have not tried as yet! I would like to try the Buttermilk one. I think that this is a Great Giveaway! I would love the Double Chocolate. I have not taste it,I hope i have to taste all of them before any opinion.